Last Sunday we were enjoying our last rhubarb stalks, baked into a crisp, which is basically nothing else than a very, very lazy pie. This is a simple and versatile recipe and almost every ingredient could be substituted with something else. I used coconut flour, but oat flour or even whole wheat flour would work. For the almond butter you could use any other nut butter as well. Oh, and if you don’t have rhubarb, use berries or even apples. I used a 22 cm bread pan (9-inch loaf pan) for this recipe, and that makes enough for three people. P complained that the filling wasn’t sweet enough. He’s probably right but it’s no problem to double the amount of sugar mixed with the rhubarb. 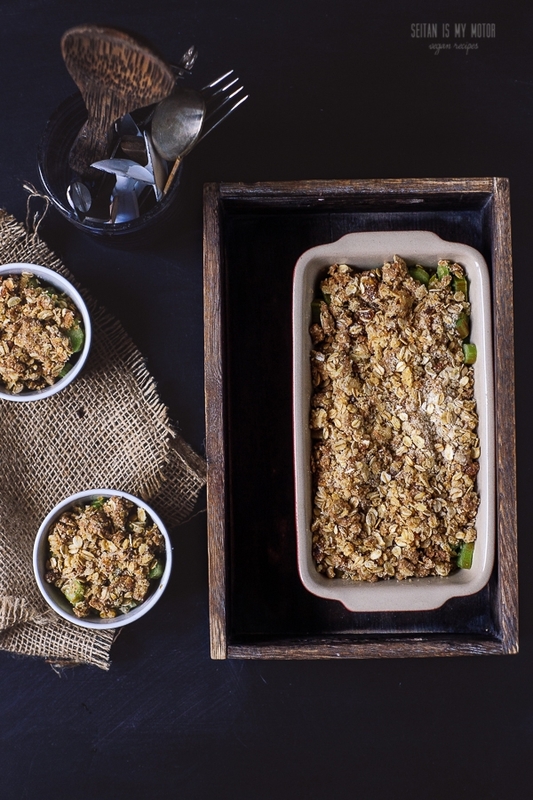 Place rhubarb, cornstarch, and agave nectar in a 22 cm (9 inch) loaf pan and stir to combine. Combine remaining ingredients and stir well. Sprinkle on top of rhubarb. Bake for 20 minutes or until the rhubarb is soft and the topping crispy. 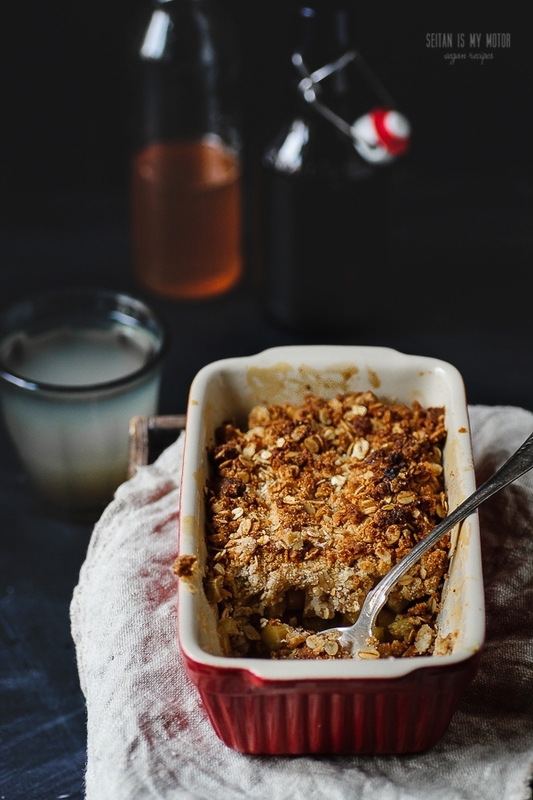 I always find it funny that some people call it crisp – I grew up with this dish as a crumble! Looks delicious. We have been having a lot of rhubarb lately, I have a crumble of my own coming up – I love it with apple or strawberries and orange zest. For many years I have had tons of rhubarb in my backyard and I did not know what to do with it, and now thanks to you I can see many ways to use this vegetable in a vegan way. Thank you so much.